A proper salad needs just the right balance of textures, flavors and colors. Sometimes this requires you to combine what seems like a million different ingredients, and other times you need just a few. Luckily, you only need a handful of classic ingredients to make the simple, flavor-filled pasta salad below. The recipe I created makes enough for a crowd and is a great option to serve at a picnic or backyard barbecue. More often than not though, I have this dish on hand so I can take a tasty, refreshing lunch to the office. It travels well, tastes great chilled or at room temperature and it’s far from another boring salad or sandwich. 1. Bring a large pot of water to a boil. Add the string beans and cook for 1 to 2 minutes or until crisp-tender. Remove from heat and plunge into an ice water bath to stop the cooking process, drain and set aside. 2. Bring the water back to a boil and add the tortellini. Cook according to package directions, drain and set aside. 3. Meanwhile, in a small bowl, whisk together the olive oil, balsamic vinegar, Dijon mustard and honey. Mix until well combined. Taste and add salt and pepper as desired. Set aside. 4. In a large bowl, combine the string beans, tortellini and tomatoes. Add dressing and toss to coat. Let flavors develop for 10 to 15 minutes before serving. SWWU Tip: The tasty balsamic vinaigrette used for this dish also tastes great over greens or as a dressing for chicken. 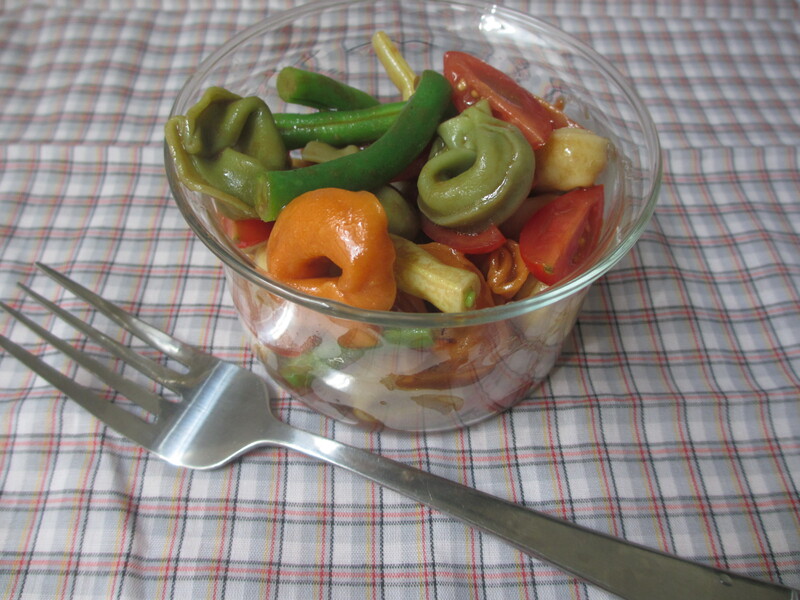 This entry was posted in In the Kitchen and tagged @SWWUblog, balsamic vinaigrette, in the kitchen, picnic, quick and delish, side dish, string bean, summer, tortellini, yellowstring bean by Something We Whipped Up. Bookmark the permalink.